Crisp Green Beans with Bacon and Shallots, Thyme for Cooking summer sides. 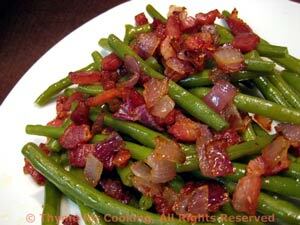 Using bacon and onion or shallots to flavor green beans goes back to my childhood. My mother would 'cook up a mess of beans', with lots of bacon and onion to flavor them, then finish the whole lot off with heavy cream. It was wonderful.... I try for the flavor without quite so much artery clogging fat! Sauté bacon in a small frying pan. When bacon is crisp remove and crumble. Add shallots and sauté until transparent. Add beans, 1/4 cup of water, turn heat to low, cover and simmer until done - about 15 minutes. If beans dry out add a little more water. When done transfer to serving bowl (there should be little or no liquid left - if there is just pour it off). Add crumbled bacon and serve.